Bill Kerns never had a cell phone. He never had a computer either, at least that’s what his close friend and former assistant coach Billy Bennett told me this week. Actually, I never doubted it for a second. Bill Kerns was a bit old school and if you followed his Bridgeport High School basketball teams and watched how they played defense and focused so much energy there you knew he was part of an era that did things different and, usually, did things the way they should still be done. I know for certain Bill Kerns was always comfortable with who he was as a coach and as a teacher. Years later, I say with the same certainty from my last encounter with him that he was comfortable in his role as friend, husband, father and doting grandfather. I’m certain Bill Kerns was many things to so many people for every minute of every day of a life that certainly had its moments. Sadly, as most of you know, Bill Kerns passed away Wednesday at the age of 71. The man who taught and coached thousands of individuals primarily at his alma mater of Bridgeport High School was gone. But what a legacy he has left behind. If you, only knew him or observed him in his early days as a track coach or what he was primarily known for as a basketball coach – whether it was a good impression or a bad impression – you didn’t get to see the entire picture and may not understood everything Bill Kerns had to offer. Billy Bennett said he made that mistake himself. Publicly, there was nothing more special than the way Bill Kerns ended his coaching career. I remember thinking, as his team headed to Charleston in 1993 that it would be one heck of a story for the Indians to win their first state title with Coach Kerns’ son Matt (the Class AA player of the year) leading the way and the coach stepping down as a champion. Of course, that would mean the Indians would have to win three straight games and Kerns would actually have to be looking to step down. As it turns out, the Indians did just that. 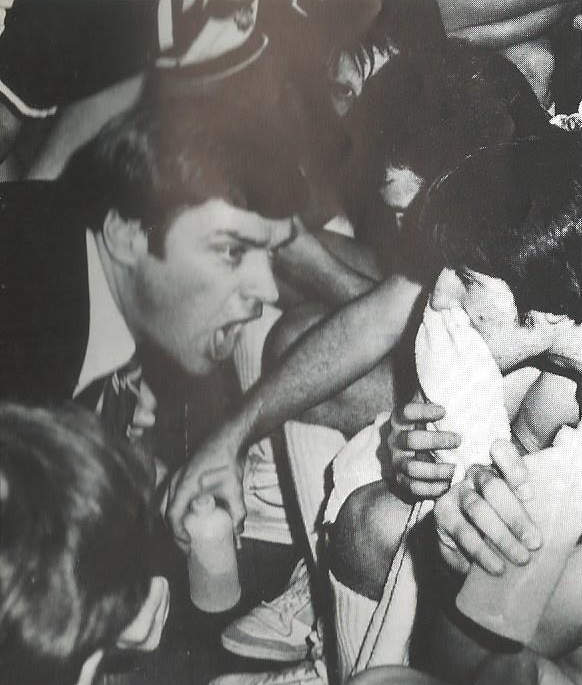 A team deep and talented brought home the first-ever boys basketball championship in school history and Bill Kerns did what so few ever get to do. He left the game as a state championship coach. Solidifying Bridgeport as a force that had officially arrived statewide in boys’ basketball was just one of the story lines that season. “The season was special for a lot of reasons beyond that, including coaching his son on a state title team. You look back and see all of those great kids we got to coach and 25 years later everyone is still close,” said Bennett, the current and long-time head coach at Robert C. Byrd. “You get a bond from accomplishing what was accomplished and it doesn’t go away. Bill Kerns coached for many years and accumulated a record of 250-151 and won even more games. Before coming to BHS, he was at Martinsburg as the jayvee coach and finished with a combined total of 310 victories. 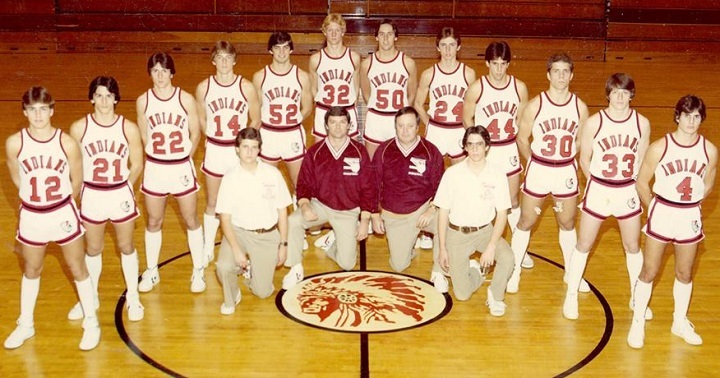 The three biggest, though, were those back-to-back-to-back wins in Charleston in ’93 against Pocahontas County, Ravenswood and Oceana to get a 21-4 record and an elusive state championship. Sports was in his blood. He was a standout athlete at BHS. He later went on to compete in track at West Virginia University where he set records as a full scholarship winner as well as playing on the freshman basketball team. In all my years of knowing Bill Kerns, he never once told me about his past athletic accomplishments. He had his own players, his son, his wife and his grandchildren (Matt's boys Nathen and Tyson and his stepgranddaughter Emily) all those years he’d rather talk about. There was also Bill Kerns the teacher. He started teaching there in the latter part of the 1970s and came in with plenty of familiar names, including Hugh Gainer. He primarily taught driver’s education, but also in his early years – according to Gainer – taught senior English as well. “Everyone liked him and got along with him. He was so young and full of energy and enjoyed those kids when he was teaching; I mean he really enjoyed it,” said Gainer, who has been friends with Kerns for decades. “I always told him I was afraid to get in the car with those kids and he would just laugh. Teaching, to those at the school, and coaching were what most saw publicly. As mentioned, there was more. And I saw it up close and personal just about every time I was at the boys’ state basketball tournament. Kerns either went with his team, when his team didn’t get there or after leaving the game for a span of nearly 50-straight years. It was there he would usually show up with Matt. His son, now a grown man and a successful one at that, would often bring the grandchildren. Let me assure you, there was no hiding his love for those grandkids. It was written in his ear to ear smile when talking about them or being around them. Coach immediately asked why I had my pink shirt on. I told him for my wife, who was a survivor. He smiled, gave her a huge hug and said “This is my wife Sue. She’s a survivor too.” I returned the hug and Bill Kerns, someone who treated me with kindness and respect well beyond anything I ever deserved (including several handwritten notes through the years that I treasure) somehow managed to take a solid friendship and make it even stronger. My last deep conversation came in June of last year. I was working on a story involving him and needed to get something for the article and he invited me to his house. I was pretty well slammed with work that day and told him I would just be a minute. I ended up staying and visiting for an hour as he talked about the past, talked about his wife, talked about Matt, and talked with a glow that could only be appreciated if seen about his grandkids. We parted with a handshake and a hug. I imagine many others’ last impression or interaction may have been the same. “I wish those who only saw him from the bleachers would have gotten a glimpse of him as a man away from the floor. If you could have filmed what he was like, you could have seen the love because it was transparent,” said Bennett. Take Bennett’s word for it. It’s true. Besides, even if you could have filmed it with a cell phone while he was coaching Bill Kerns wouldn’t have had one. In the end, Bill Kerns wasn’t about technology or the latest gadgets. He was more comfortable putting pen to paper or picking up the landline phone to communicate. Earlier I called it old school. In reality, it’s endearing and partly the fabric of a man whose life’s quilt is one of beauty. Bill Kerns communicated to the masses for decades without a text, a tweet or a private message on Facebook. He didn’t need it. He made an impact along his journey that will be felt for generations to come. Bill Kerns did it his way – an old-school and endearing kind of way. Hang the whistle up Coach as your work here is complete. You leave us as you left basketball – a winner. Click HERE for the obituary. Editor's Note: Top photo shows Bill Kerns, center, with his friend Bill Bennett, left and Doyle Sickles in 2013 during a 20-year reunion of the BHS 1993 state championship team. Second photo shows a young Bill Kerns with Robert Koepka, while he's shown getting his team fired up in the huddle in the third photo. 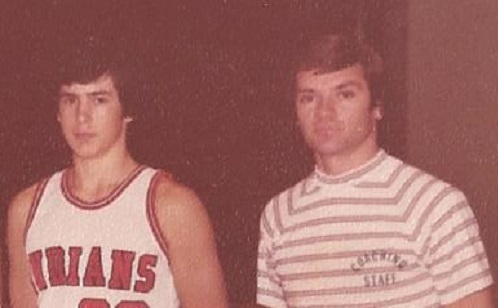 The fourth photo shows Kerns to the left of the logo kneeling with assistant Tom Brown during the 1981-82 team photo session. The fifth photo shows the 1993 state championship team. 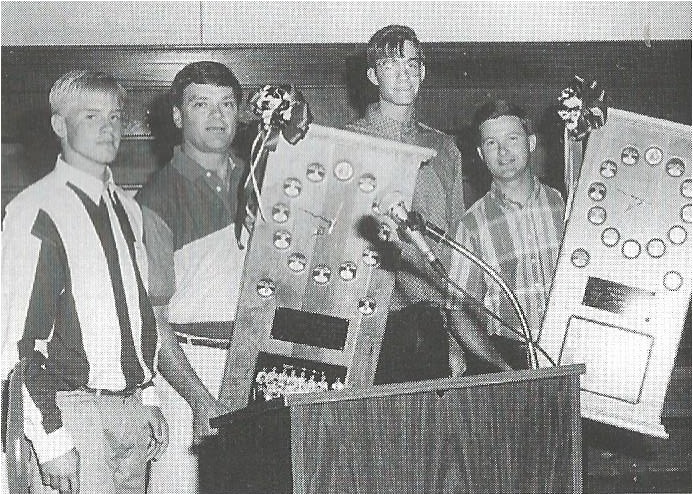 Bottom photo shows, from left, Matt Kerns, Bill Kerns, Russ Sickles and Bill Bennett in 1993 at a sports banquet where players and parents presented the coaching staff with a momento from their championship season.